A copy of the hoax letter. 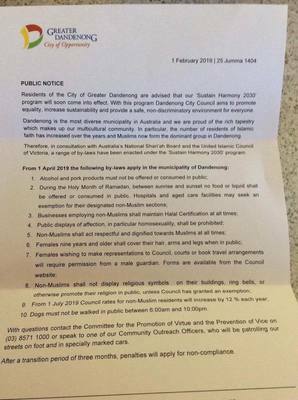 A letter headed with the Greater Dandenong Council logo and purporting to introduce ‘sharia’ by-laws has been denounced as a hoax. Dated 1 February or “25 Jumma 1404”, the “public notice” was hand-delivered across Melbourne, announcing a list of 10 by-laws applying from 1 April. 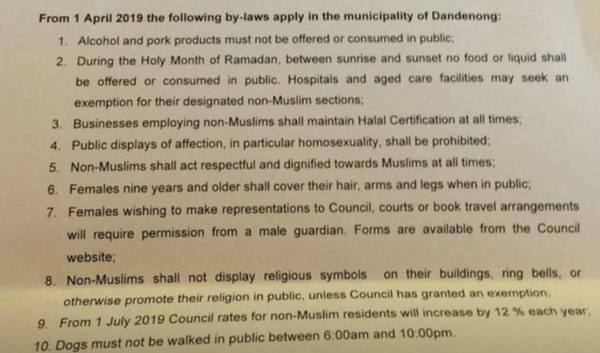 They included a ban on serving and consuming alcohol and pork in public, the ban of food and drink in the daytime during Ramadan and females having to cover their hair, arms and legs in public. It also banned daytime dog walking and public shows of affection, particularly “homosexuality”. A 12 per cent rate hike for “non-Muslims” was also announced. The letter stated that the council was proud of its diversity and that “Muslims now form the dominant group in Dandenong”. On a Facebook post, the council said the “fake” letter contained “offensive and misleading” information and was “most definitely not in-line with the views of Council”. Dandenong MP Gabrielle Williams, in a Facebook post, said the letter was “designed to create fear and incite racial tensions”. “It appears to target our Muslim community. “This is ultimately a cynical (and toxic) attempt to undermine our successful multiculturalism. In response to the letter, right-wing political group Australian Liberty Alliance posted on Facebook its desire to “stop Islamisation”. “With over 30 per cent of Dandenong’s population following Islam, Muslims are now the dominant religious group in the outer eastern suburb of Melbourne,” the ALA posted. Kuranda Seyit, director of Forum on Australia’s Islamic Relations (FAIR), said the letter was “obviously from someone with a sense of humour, albeit in poor taste”. “A lot of effort has been taken to give the letter an air of authenticity however it’s riddled with so many inconsistencies. “It’s important to note that the by-laws that were stated in the letter, would not even apply within an Islamic society or country. Mr Seyit, who lives in Dandenong, said letters created more tension and doubts in the minds of residents. “Fear-mongering Islamophobes” often created misconceptions about sharia, he said. “Sharia is a personal aspect of one’s religion and it’s the rules that govern an individual’s practice and traditions like prayer and giving charity.